Another long weekend is upon us and I apologise that my letter is coming out a day late on “Workers Day”. The delay is due to several reasons; one being the happy return of my younger daughter from NYC, so good to have her home (despite her walking into the shop today and breaking a wine bottle which I understand is a sign of good luck); the packaging and delivery of hundreds of dry goods for the J’burg shop and transporting this to couriers in the northern suburbs yesterday which entailed travelling through miles of afternoon traffic as everyone left early for the long weekend, getting lost and ending up underneath the railway station in Bellville, fortunately I got to the couriers just before they closed up; this morning I had to be at SAA cargo at the crack of dawn to collect kilos of pates and cheese and get back to open my shop by 8 30 for my early clients. (As you are all aware we do not close on Public holidays but finish early at 2pm) I had a great morning in the shop then continued preparing stock sheets for J’burg. After a quick tea by the sea, I am now back at my laptop preparing this newsletter, therefore I think today is aptly named just for me. My new range of frozen French butter croissants (R11) and Pains-au-chocolat (R13) has been so successful, with great feedback from clients who have tried them. I re-stocked on Monday as I sold out within 24 hours of launching them. I have now added frozen Demi-Baguettes (R13) – these are traditional white baguettes made in France in the half-length size, as this is more practical for storage in the freezer. They are already selling well so I really think I have found a soft spot in the Cape Foodie pleasures. Combined with the new range of French Jams and preserves that I brought in, you can have a traditional Parisian breakfast in the warmth of your home on cold winter weekends. I will be in J’burg from Wednesday to Sunday and filling the shelves of the new shop, training and working in the shop. Launching a new venture is really stressful with lots of unknowns and challenges to handle, I wonder if my venture partner really knew what he would be letting himself in for. He is doing all the hard work of decorating the shop and organising of all the operational side. Both of us are shattered but as everyone says “Africa is not for Cissies”. I know it is going to be great, once we have it all set up, as we already have a lot of interest from clients up there. Thank you to all of you who have told me that you have passed on the word to your friends in J’burg that the new French “cheese shop” opens on Saturday 9th May at the Patisserie de Paris and French Market JNB, 9 MacKay Avenue, Blairgowrie. The phone number is 011 326 0913. 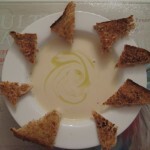 Recipe 17-2015 Velouté de Chou-fleur au Crème Légère for 6 persons – boil a cauliflower for 20 minutes until soft, drain and blend until smooth. Make 500ml stock with either veal or beef stock, add to blended cauliflower, add in 500ml Crème Légère and blend again. Put mixture in saucepan and warm up gently until well heated but not boiling. Add salt and pepper to taste. 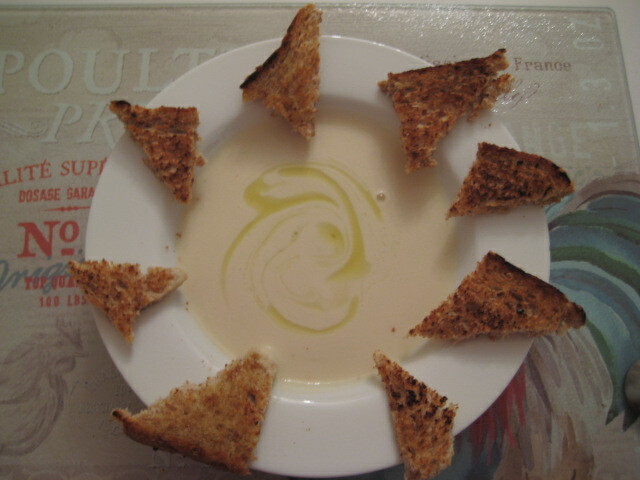 Serve hot with a few drops of truffle oil drizzled over the top and little croutons or some crusty baguette. I have lots of delicious cheeses in stock including some Goat’s camembert. There are plenty of pates which make for a lovely easy lunch and many more delicious treats. We are open every day this weekend so do pop in and sample something new. Remember that you can find details of the products and price list on this website.